An article in a Massachusetts newspaper in 2013, entitled: “[Superintendent] Looking to Curb Sped Referrals,” (1) highlights a growing trend of school districts actively discouraging the referral of students for special education evaluations. To many parents, this may sound perfectly reasonable. Special education services cost money, so why shouldn’t the school district be able to decide what conditions to place on admission to it? The answer lies in the purpose for which RTI is being used and how it is implemented. RTI is loosely defined in the regulations that accompany the 2004 reauthorization of IDEA (2) with the goal of screening all students early in their school career to identify any who are struggling and, through increasing levels of intervention, prevent the need for more costly special education services later. By applying the screening process universally, it represents an effort to make IDEA, which addresses the unique needs of individual students, more closely conform with No Child Left Behind (NCLB), which attempts to raise standards for all students uniformly. IDEA-04 “permits” (not “requires”) schools to employ “scientific, research-based” techniques to help struggling students discovered in the screening process. 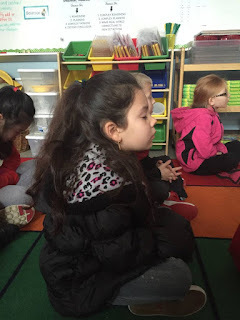 These techniques are applied in increasing levels of support, known as “tiers.” The progress of each student is monitored; if the initial tier of intervention isn’t working, the student is then referred to the next, more intense, tier. IDEA doesn’t specify how many tiers a school must use (three tiers seem to be the most common), the criteria for deciding whether a tier is working or not, nor how long a student must stay in one tier before moving to another. All of these details are left to the individual states and school districts. 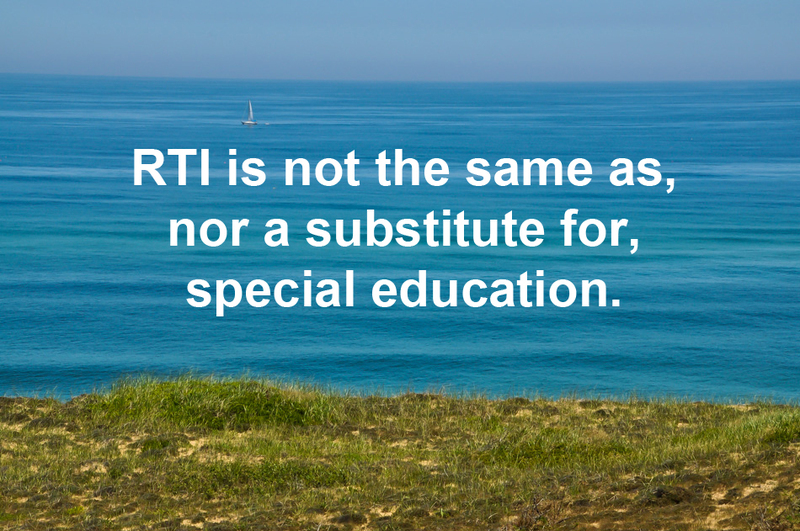 In other words, RTI is not the same as, nor a substitute for, special education. RTI does not provide for evaluations by qualified professionals to identify specific learning disabilities, and a student in RTI does not have an IEP to specify learning goals or the accommodations and modifications needed to achieve those goals. Although some schools may employ these techniques, there is no requirement to do so. 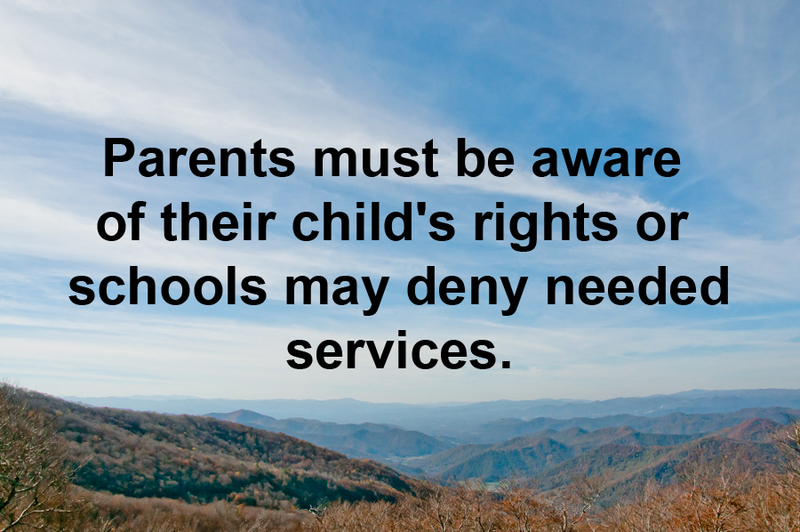 Most important, there is no legal mandate for a school to provide agreed upon services, accommodations, or program modifications, as there is when a student is on an IEP. 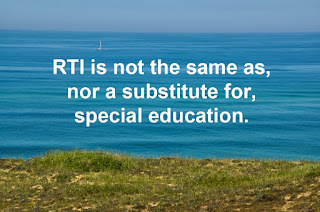 In fact, the US Department of Education makes it clear that a student in special education is also eligible to receive RTI services along with special education services. (3) Schools, however, appear to regard RTI as a substitute for special education that is less involved, and of course, less expensive. Early screening of and intervention for all “at-risk” students regardless of the presence of a documented learning disability is a laudable and potentially cost effective way to improve public education. The problem arises when the reality doesn’t match the intention. First, the parents must express concerns about their child to the school. Next, the classroom teacher, who may not have any training in special education, must agree that the parent’s concerns are valid. Only then does a child reach gate number three, the panel of “teachers and special education staffers” who are the ones to decide if there is any need for services, all without any formal evaluation of the student for learning disabilities. By contrast, IDEA has very specific criteria for determining eligibility for special education and who is qualified to make the determination. (4) Once parents request an initial eligibility evaluation and give their written consent for the necessary testing, the school has 60 calendar days (by federal law, state laws may vary) to perform evaluations in all areas of suspected disabilities. These evaluations must be performed by qualified and knowledgeable professionals. There is no provision in IDEA for multiple layers of screening by people who may not have the training or qualifications to recognize or evaluate learning disabilities. This circumvents IDEA’s mandate that schools perform evaluations in all areas of suspected disability by qualified and knowledgeable professionals. What is surprising is how clearly the superintendent admits this. When he calls the law’s evaluation requirements “a resource zapper,” he really means that his problem is the budget, as these resources cost money. Rather than provide services according to need as the law requires, he is telling the community for which he serves as the head of public education that his goal is to protect the budget by not even attempting to identify the need, and therefore denying students in his care the public education that it is his job to provide. The worst part of this admission, however, is the knowledge that the superintendent is not simply doing this out of ignorance of the law. For years, the Department of Education has warned schools not to use RTI to deny or even delay special education evaluations. How can it be possible that the superintendent is not aware of this widely publicized policy at the same time he is promoting RTI as an alternative to special education evaluations? Unfortunately, this school superintendent is far from alone. Other school districts are adopting this policy and many are announcing it publicly. A more recent article from another town’s newspaper begins with a headline that announces that the district’s special education program is to be “culled” of excess students, as if the students were a herd of over-reproducing deer. It is not clear from the article how the school administration was planning to remove students already in special education. That is a process that can only be done through extensive evaluations with objective data to prove that a previously identified learning disability no longer exists. It is possible to have sympathy for those administrators and public officials who might have good intentions but who are caught in the dilemma of trying to balance available resources and the needs of students. But, the gatekeepers who choose to keep their jobs and future pensions by protecting the school budget are not the ones who lose. It is the children with disabilities and the families who are struggling with these disabilities who get lost in the bureaucratic spin cycle. This is why the state and federal special education laws were written, to give the most vulnerable and least powerful the right to a public education appropriate to their abilities. Parents need to understand these rights and not let those with agendas other than providing an appropriate education take these rights away. 1. “Kerble looking to curb SPED referrals” by Lynne Hendricks, Newburyport Daily News, January 14, 2013. 2. 34 C.F.R. §§ 300.307, 300.309, and 300.311. The only appearance of the words “response to intervention” occurs in 300.311 (a)(7). 6. “An RTI process does not replace the need for a comprehensive evaluation” From Zirkel letter. 7. “Dedham Public Schools Special Education Program to be Culled” by Sara Feijo, Dedham Transcript, August 29, 2013. From WBUR 90.9 FM's Blog "Cognoscenti"
The iPhone trills. It’s 5:15 am. Maybe my children will drink in those last 15 minutes before their official wake time. Or maybe the whole house will be startled awake by the alarm or the dog or the toilet’s flush. If so, that will be 15 precious minutes, lost. My three children fight for their sleep. They refuse to climb out of bed and search for pants, socks and uniform shirts, to put their lunches in their backpacks, to pack a book for the 45-minute bus ride. They are not sick, but they are tired. Tired of this routine, as thousands of children — and their parents — in the Boston public school system are. In Boston, the history and unintended consequences of segregated schools haunt both the city and the schools in surprising ways, like stealing children’s sleep. Busing became the key to desegregation, and for more than 40 years, children have traversed this sprawling, historic city in long yellow buses built for streets much wider than ours. The city’s ensuing traffic issues led to staggered start times in public schools, ranging from 7:15 to 9:20 a.m.
With calls to shrink the sprawling zones that determined school choice, as well as pressure to reduce busing costs, the Boston Public Schools (BPS) developed a kindergarten through sixth-grade “home-based school choice” assignment process in 2013 that uses an algorithm developed by an MIT student. This system aims to limit the distance children travel to schools, but if they are expected to have pencil in hand by 7:15, children are rising early no matter how long their commute. Here’s the problem with denying children the sleep they need: they don’t learn as well when they are tired. Grades are not the only thing to suffer — students experience anxiety, depression, poor concentration and behavioral problems. What’s more, the latest research on teenagers’ sleep patterns suggests that, as puberty begins, their circadian rhythms shift to a “sleep phase delay,” which means they naturally fall asleep as late as 10:00 and 11:00 at night, even as their need for up to nine hours of sleep remains the same. Deborah J. Bennett: “Grades are not the only thing to suffer. So consider the next step in the BPS schooling ladder: high school. For students who hope to attend one of the city’s three sought-after exam schools, there is no home-based placement algorithm. The start times for these schools, scattered across the city, are all before 8:00 in the morning. That means that thousands of teens who live nowhere near their school rise as early as 5:30 in the morning in order to get to school on time. Our neighbors’ kids barely have time to grab a cereal bar on their way out the door before they board one or more MBTA buses to get to school, where they toss their backpacks and lunch in a locker before racing to Algebra at 7:20. While parents at one exam school in Boston tried, unsuccessfully, to have their start time changed, parents and school administrators from middle class suburban districts outside of Boston are having more success in doing so. Which leads us to a compelling piece of research that suggests that there is a class and racial divide when it comes to sleep. As one article puts it, “sleep has its own caste system.” Those who are lower on the socioeconomic scale get less sleep and have lower quality sleep when they get it. Those who are lower on the socioeconomic scale get less sleep and have lower quality sleep when they get it. The causes? Multiple jobs, longer commutes, stress about paying the bills, and living in loud, unsafe communities where it can be hard to find that cool, quiet, dark cocoon that researchers say leads to optimal sleep. People who are suffering from chronic sleep deprivation are not just fatigued. Researchers now know that people are sick and dying from the resulting health complications: obesity, diabetes and heart disease. While the research has focused primarily on working adults, children experience the same poor sleep conditions as their parents. Children in Boston are subjected to the added stress and sensory input of long commutes on subways and buses, which can leave them unfocused, anxious and overwhelmed. Most people are well aware of the inequities between urban and suburban schools — per pupil spending, school facilities and teacher-to-student ratios. However, we must consider more basic needs. Are children getting good nutrition? Are they safe, loved and nurtured at home and at school? And, are they getting enough sleep? "...All students in special education who receive services under IDEA are automatically protected by Section 504 (of the Rehabilitation Act of 1973)." The issue was that a high school student in special education was denied the opportunity to participate in a summer soccer camp attended annually by members of his high school soccer team. The school district had decided that the student, who was an active member of the team, must have an aide accompany him to the camp to act as a chaperone. Every year, the school didn’t seem to be able to locate a suitable one. Though the parents (and grandparents) had offered to accompany their son and act as a chaperone, the school refused to consider their offer, telling them that they were not qualified. The parents then offered to pay for an aide that the school approved, but the school would not discuss their offer with them. The result was that their son was not allowed to attend the camp with his teammates. Each year was the same story. The parents would call school officials, including the district’s director of special education, asking to arrange for their son to attend soccer camp, and each year no one from the school would return their calls. Finally, the summer before their son’s senior year, not knowing what else to do, the parents contacted the city’s disability coordinator, a person who worked for the city and not for the school system. Within days of this contact, and to the complete surprise of the family, the school managed to find a suitable aide. The article quotes the district’s assistant superintendent as saying: “I think the school department has gone above and beyond, we’re really pleased to be able to send [the student to camp],” while adding that the school was not legally required to provide access to an extracurricular program. Fortunately for all children in special education, the assistant superintendent does not get to decide what the law requires. All students in special education who receive services under IDEA are automatically protected by Section 504. Had the parents known their rights about this basic protection, they would not have had to put up with years of frustration and gatekeeping by their school district. We are sure that this possibility is one that the school district in question should devoutly hope the parents of the child described in the article do not pursue. By Laura Jansons, Psy D.
According to the American Psychological Association, Pediatric Neuropsychology is a professional specialty concerned with learning and behavior in relationship to a child’s brain. A pediatric neuropsychologist is a licensed psychologist with expertise in how learning and behavior are associated with the development of brain structures and systems. Formal testing of abilities such as memory and language skills assesses brain functioning. The pediatric neuropsychologist conducts the evaluation, interprets test results, and makes recommendations. The neuropsychologist may work in many different settings and may have different roles in the care of your child. Sometimes, the pediatric neuropsychologist is a case manager who follows the child over time to adjust recommendations to the child’s changing needs. He or she may also provide treatment, such as cognitive rehabilitation, behavior management, or psychotherapy. Often, the neuropsychologist will work closely with a physician to manage the child’s problems. Some neuropsychologists work closely with schools to help them provide appropriate educational programs for the child. School assessments are usually performed to determine whether a child qualifies for special education programs or therapies to enhance school performance. They focus on achievement and skills needed for academic success. Generally, they do not diagnose learning or behavior disorders caused by altered brain function or development. Why Are Children Referred to a Pediatric Neuropsychologist? What is Assessed in a Neuropsychological Evaluation? Some abilities may be measured in more detail than others, depending on the child’s needs. A detailed developmental history and data from the child’s teacher may also be obtained. Observing your child to understand his or her motivation, cooperation, and behavior is a very important part of the evaluation. Emerging skills can be assessed in very young children. However, the evaluation of infants and preschool children is usually shorter in duration, because the child has not yet developed many skills. By comparing your child’s test scores to scores of children of similar ages, the neuropsychologist can create a profile of your child’s strengths and weaknesses. The results help those involved in your child’s care in a number of ways. Testing can explain why your child is having school problems. For example, a child may have difficulty reading because of an attention problem, a language disorder, an auditory processing problem, or a reading disability. Testing also guides the pediatric neuropsychologist’s design of interventions to draw upon your child’s strengths. The results identify what skills to work on, as well as which strategies to use to help your child. Different childhood disorders result in specific patterns of strengths and weaknesses. These profiles of abilities can help identify a child’s disorder and the brain areas that are involved. For example, testing can help differentiate between an attention deficit and depression, or determine whether a language delay is due to a problem in producing speech, understanding or expressing language, social shyness, autism, or cognitive delay. Your neuropsychologist may work with your physician to combine results from medical tests, such as brain imaging or blood tests, to diagnose your child’s problem. Most importantly, testing provides a better understanding of the child’s behavior and learning in school, at home, and in the community. 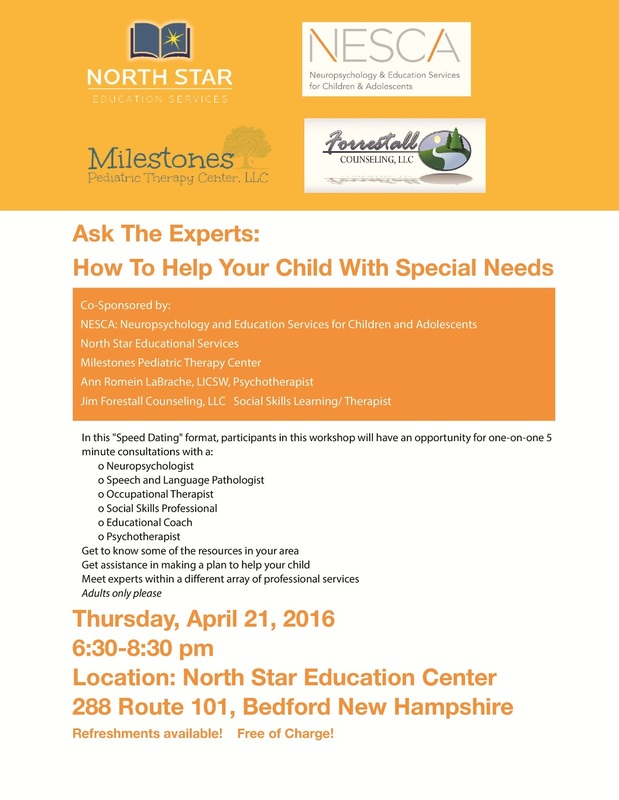 The evaluation can guide teachers, therapists, and you to better help your child achieve his or her potential. 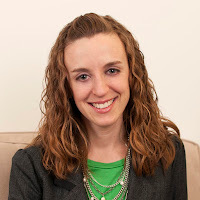 Laura Jansons, Psy.D. is a Licensed Clinical Psychologist and recently entered Board Certification with the American Board of Professional Neuropsychology (ABN). Dr. Jansons assesses developmental disorders including autism and ADHD, learning disabilities, executive dysfunction, learning and memory problems; she also provides assessments for degenerative disease including Alzheimer’s and other dementias and TBI. Her practice is in Arlington Heights, IL. By Matthew Saleh, J.D., Ph.D.
As your child’s advocate, it’s important to understand all the ways you can and should be involved in your child’s educational planning. The IDEA contains specific safeguards to ensure that parents play a strong role in every aspect of the decision-making process. Parent participation in the educational decision-making process for a child with LD is a fundamental principle of The Individuals with Disabilities Education Act (IDEA). The law is specific about this point, and includes a number of safeguards to ensure that school systems involve parents at every stage of the process, including placement, transition planning, and, if necessary, dispute resolution. Parents are entitled to a copy of the Procedural Safeguards outlining their rights under the IDEA at least once per year, or immediately following a child’s referral for evaluation, the filing of a complaint by a parent, or a parental request for information regarding dispute resolution. At 18 years of age, these rights transfer to the student, unless the parent gains Power of Attorney for Educational Matters or other Guardianship rights. The law also guarantees a role for parents in examining educational records pertaining to their child’s placement and the provision of a Free and Appropriate Public Education (FAPE) . 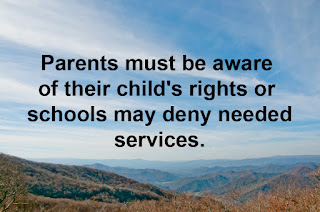 In fact, schools are prohibited from making decisions regarding placement or FAPE without involving the child’s IEP team, which includes the parents. The IDEA guarantees that parents be “equal members” of their child’s IEP team, including all aspects of IEP development, review, and revision. The school district must provide parents with advance notice of a planned IEP meeting, and must inform them of both the purpose of the meeting and a list of those individuals who will be attending. It is not acceptable for a school district to convene an IEP meeting without the parents present if they have made it clear they want to attend, or if they have not been properly notified. The right of parents to be involved in all meetings about their child’s education extends to student evaluations, including determining whether a child has a disability or meets the eligibility criteria for special education services. Furthermore, parents have a right to all education files and evaluation materials concerning their child, including email correspondence among members of the school staff. When a school seeks to evaluate a student, the parents have a right to informed consent for an initial evaluation and any subsequent evaluations. Informed consent means that the school district must inform parents about specifics regarding the evaluation to be conducted. This includes information about the purpose of the evaluation, who will be conducting it, and what their training is. If there is no data to support an evaluation in a specific area, then parents do not have to consent. Parental consent can be withdrawn at any time prior to an evaluation, which is traditionally conducted every three years. In addition, parents have the right to obtain an Independent Educational Evaluation (IEE) for their child, and the right to refuse further evaluation of their child. If the parents disagree with an evaluation conducted by the school district, they do not need to give a reason for their disagreement or for their pursuit of an IEE. If the parents request an IEE, the school district must either perform the evaluation with the evaluator of the parent’s choice (provided they conform with the district’s requirement for evaluators), or file for due process to defend their prior evaluation. During the IEP meeting, any requests that are made by the parents must be documented on the Prior Written Notice (PWN) page of the IEP. The school district must state what was requested, and they must accept or decline the request. They are also required to document their reason for declining the parent’s request, for example, by noting data or evaluations that support the refusal. The PWN requirement has legal significance because it documents the fact that the parents have put the school district on notice of their request, as well as the date that the request was made. This documentation can become an issue should the matter go to due process at a later date. Sometimes, an issue arises where a school has “predetermined” a child’s placement prior to engaging in the IEP process. In line with the IDEA’s provisions for parent involvement, decisions about a child’s placement should be made only after the child’s IEP is developed. Parental involvement is a crucial component of this requirement, because as guaranteed equal members of the IEP team, parents play a central role in preventing schools from predetermining their child’s placement. If, after the IEP process is completed, a parent disagrees with their child’s proposed placement, that parent is entitled to written notice of their right to dispute resolution through mediation, administrative complaints, or due process hearings. It is important for parents to understand that when they advocate for their child’s rights and involve themselves in the educational decision-making process, they are doing so within a legal framework that supports their efforts to advocate for their child. Efforts by school systems to curb the parent’s role run counter to the purpose of the IDEA. A parent advocate should always assume that their involvement is not only permissible, but preferable. Matt Saleh, J.D., Ph.D. is a Research Faculty member at Cornell University’s Yang-Tan Institute on Employment and Disability and a 2015-16 Fulbright Scholar through the U.S. Department of State. Common signs that can hide in plain sight. Teachers are often the first to notice that a child might have a learning disorder. 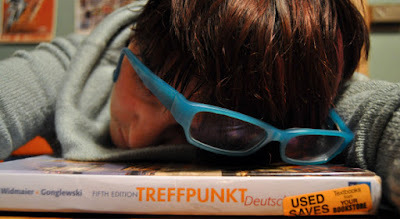 Sometimes the signs are easy to spot — a student who just isn’t making headway in reading, for example. Or a child who, despite obvious effort, can’t master the times tables. But the signs are not always as clear, and many children, embarrassed that they are struggling to do things that seem easy for other kids, go to pains to hide their difficulties. If you notice that a student who seems as if he should be succeeding, but he isn’t —either in one specific subject or in his overall school performance — it could be a sign that he has learning disorder. This is often described as a discrepancy between ability and aptitude, i.e., a gap between what it seems a student should be able to do and what he’s actually able do. A student who writes fantastic essays but has serious difficulty getting through basic math assignments, or vice versa. A kid who’s great at answering questions in class but can’t get her point down on paper. A student whose intelligence is obvious in person, but isn’t reflected on his report card. Kids who aren’t doing as well in school as expected may appear to be lazy or just not applying themselves, when in fact they may be struggling with a learning disorder. Adults with learning issues recall being told repeatedly, before they were diagnosed, that they weren’t trying hard enough. Kids who look like they’re not trying may actually be trying very hard, but failing, or trying to hide an embarrassing deficiency. If a student constantly has to be reminded what to do next, you might think he’s not paying attention, but it could be a sign that he’s having difficulty with what’s called “working memory” — holding, processing and building on new information. This is a common issue for kids with learning disorders. Trouble remembering assignments and doing them correctly. Students with learning disorders often try conceal their struggles from teachers and peers. Even if they’re managing to keep up with school work, with extra effort, it may be taking a big toll on their self-esteem. If a student comes across as excessively shy during class — hanging back during group projects, sitting in the back row, or doing everything in his power to avoid being called on during class — he may be trying to hide a learning issue. It’s also important to remember that hiding doesn’t always look like what it is. In fact, for some kids it may look just the opposite. Where some students shrink down, hoping to go unnoticed, others act out, drawing attention away from deficits by becoming the class clown, being defiant, or pretending to be “too cool” to care how they’re doing in school. A child may feel embarrassed to hand in work that is incorrect or unfinished. Total wipe-out. Kids who struggle with memory and organization may have simply forgotten there was an assignment due at all. Lost! Even when homework does get done, it still has to make it from home to school. Every kid is bound to miss an assignment once in a while, but if a student routinely fails to turn in her homework it’s time to take a closer look at what’s going on. Kids with learning disabilities often struggle with time management, transitions and organization. These timing troubles can cause problems both in school and at home. A child who always seems to take ‘too long’ to complete tasks – from assignments to putting on his shoes after gym. A student’s who’s parents report that it takes him hours to get through his homework at night. A kid who’s chronically late to school (I missed the bus – again!) or always seems to be rushing from one class to another. Most kids will have trouble with a test now and then, but if a student seems to have more trouble than expected it can be a clue that he has a learning disorder. A student who always ends up scrambling to finish the test on time — or routinely exceeds the time limit — regardless of reminders. A child who’s always the last one still working on a timed assignment. A student who fails numerous tests despite having studied. School can be an emotional minefield for students with learning disorders. From struggling to keep up with peers to falling behind on schoolwork, the opportunities to feel bad about themselves can be overwhelming. Kids with learning disorders often struggle with feelings of shame, embarrassment, and low-self esteem. If a child often seems to be down on himself, depressed, or frustrated at school, an undiagnosed learning disorder could be a cause. 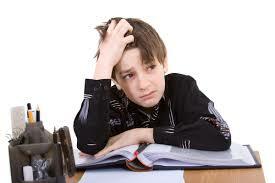 Kids with learning disorders may develop serious school-related anxiety. Especially before they are diagnosed, when they don’t understand why they keep up with their peers. Additionally, kids with learning disorders often struggle with “self-regulation,” meaning they lack the tools to manage and process emotions and are easily overwhelmed — which can lead to outbursts. For example, a student who flies off the handle when he’s asked to stay in his seat, or is reduced to tears when asked to try a challenging assignment. Students with learning disorders often go to great lengths to avoid school situations that trigger anxiety or stress. 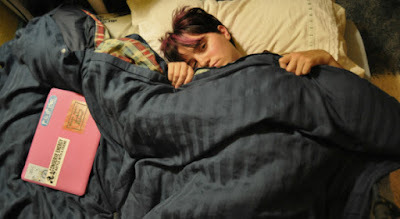 Staying home “sick” on days when there are tests or other important assignments. Refusal to participate in challenging activities. Making frequent trips to the bathroom or asking to go to the nurse when faced with stressful assignments or tests. Helping a student who has a learning disorder get the attention and support he needs to do better and feel better will benefit that child– both in school and out – for years to come. Do you ever feel frustrated with your child? Find yourself shouting often and imposing punishments or rewards in reaction to challenging behavior? Do you wish you had a more effective parenting approach that also helps to build a better relationship between you and your child? The Think:Kids Collaborative Problem Solving (CPS) approach, based in MGH's Department of Psychiatry, provides parents with concrete tools to better understand and parent their kids in the face of day-to-day challenges – e.g., getting to school, homework, bedtime, screen time – and more serious challenges. It’s based on the understanding that many kids lack the skill, not the will, to behave well – specifically skills related to problem solving, flexibility and frustration tolerance. For more information and to register for an upcoming CPS overview group at the Ely Center in Newton or in Brookline, visit: http://www.betheparentyouwanttobe.weebly.com. Get to know some of the resources in your area, get assistance in making a plan to help your child and meet experts within a different array of professional services! This program is free and open to the public. Adults only, please! Refreshments will be served. Please come on time to get the consultations you prefer. Dr. Currie has particular interest in the differential diagnosis of learning and self-regulation challenges, and has extensive experience in the evaluation and treatment of anxiety-based disorders and psychiatric disorders in children, adolescents and young adults, conducting both neuropsychological and projective assessments. She is also frequently called upon to conduct workshops on the topics of anxiety and self-regulation. Ms. Flynn has over 40 years in the field of education, with experience as an inclusionary consultant, resource room and self-contained special educator. 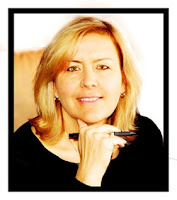 She has extensive background in developing curriculum and programming for, and assessment of students with disabilities – all exceptionalities - including experience with students who are gifted and talented or twice exceptional. She has spent over 25 years as a special education and elementary administrator, and has over 1000 hours of additional training in best practices, ASD, Learning Disabilities, Gifted and Talented and Transition, Young Adult needs, Assessment, Coaching and Administration. Mrs. Flynn is a past president of The Council for Exceptional Children – NH. Ms. LaBrache has extensive experience working in both residential and day treatment programs with children. She began private practice in 2002, and works with children, adolescents and young adults who struggle with anxiety, depression, attention issues, post-divorce struggles and school difficulties. For the past 3 years, Ms. LaBrache has been a field liaison with the University of New Hampshire in the Masters of Social work program, supervising the internship experience of students in their field placements. 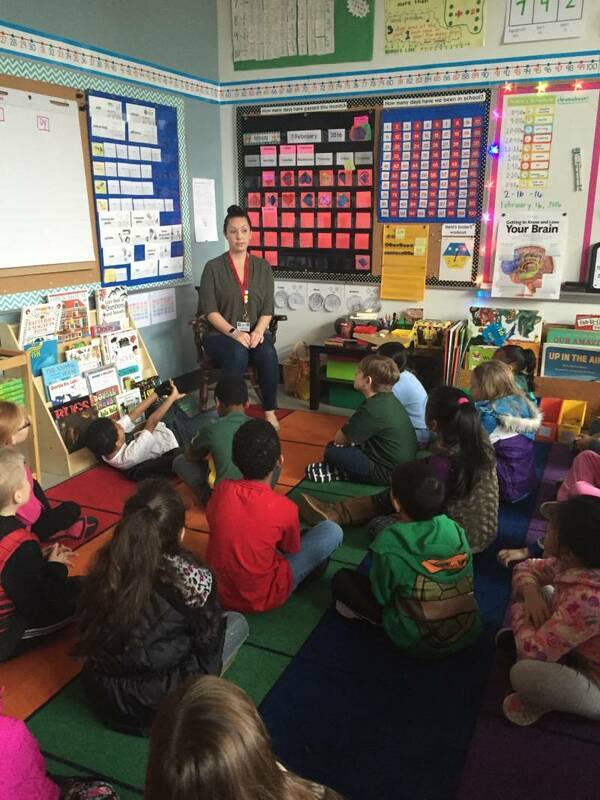 Ms. Arling has a Bachelor’s Degree in Communication Sciences and Disorders as well as a Master’s of Science in Speech-Language Pathology at the University of New Hampshire. Trina is certified in the LIPS program and she is passionate about working with individuals of all ages with varying challenges and communication needs. Ms. Mascali received both her Bachelor’s and Master’s Degree of Science in Occupational Therapy from the University of New Hampshire. She is passionate about sensory integration and she is also one of the local area providers who is certified in the Therapeutic Listening program. Mr. Forrestall is a licensed clinical social worker who has worked with children, adolescents, and adults with social, behavioral, psychiatric, and developmental needs for over 14 years in both residential and private practice settings. He specializes in working with children, adolescents and young adults diagnosed with developmental delays, learning disorders, behavioral difficulties, and /or autism spectrum disorders.